African Americans, who have new power in the first Democratic-led legislature in a decade, have blocked Governor Andrew M. Cuomo’s cannabis legislation—scheduled for inclusion in his April budget—until he outlines a proposal guaranteeing that people of color receive licenses to profit from the estimated $3 billion blockbuster industry, The New York Times reported on March 11th. Leading the charge, is the first African American Assembly majority leader, Crystal Peoples-Stokes of Buffalo. She says people of color who are entrepreneurs must receive licenses to cultivate or sell cannabis. She’s also demanding the pot windfall be invested in stimulating development in black communities. “If that doesn’t happen, there will be no cannabis legalization this year,” Peoples-Stokes promises. 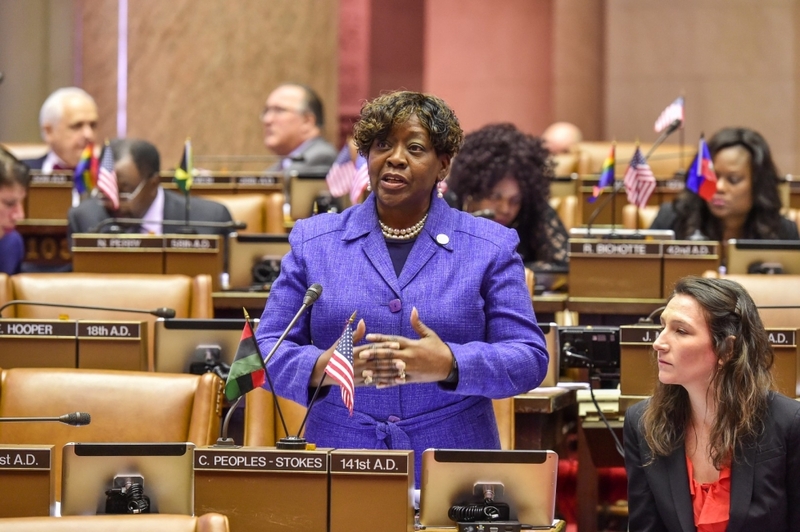 Peoples-Stokes introduced a bill that would prioritize licenses for people from communities most affected by criminalization and require half of all cannabis revenue in New York to be redirected to a community fund supporting job training. Another popular plan among African Americans would be to use cannabis revenues to repair New York City’s dilapidated subway system, so middle-class people could travel without being subjected to endless delays and train breakdowns. New York City comptroller, Scott Stringer, a top aide to Governor Cuomo, says pot legalization will be a tremendous source of revenue for black and Hispanic communities, “who were ruined by cruel and discriminatory drug laws”. “By applying tax rates in line with other states, New York State could reap as much $436 million annually in new tax revenue from legal marijuana sales, while New York City could garner as much as $335 million–funds that could be used to invest in communities most damaged by decades of criminalizing marijuana usage and possession,” Stringer says. “This is not just about dollars – it’s about justice. “There is simply no reason for New York to be stuck in the dark ages. This new analysis shows just how much New York City and State stand to benefit by moving toward legalization,” Stringer says. In 2017, Marijuana Business Daily surveyed 389 cannabis businesses and estimated that only approximately 4 percent were owned by people of color. Governor Cuomo announced he would legalize recreational marijuana this year, in a speech he gave after he won his third term last November, announcing his agenda for the first 100 days, The New York Times reported on December 19, 2018. “The fact is we have had two criminal justice systems: one for the wealthy and the well off, and one for everyone else,” Mr. Cuomo said, before introducing the cannabis proposal, describing the injustice that had ‘for too long targeted the African-American and minority communities”. “Let’s legalize the adult use of recreational marijuana once and for all,” Cuomo said, while laying out his plans for his third term as New York State governor last year. Cuomo’s new cannabis recommendation can best be summed up in a report issued in July by the state Department of Health. Meanwhile, New Jersey Governor Philip D. Murphy who made cannabis legalization a central pillar of his campaign, told the Times on March 13, “his best guess” is that pot will be legalized next year. Murphy estimates cannabis could raise $210 million in annual state tax revenue. He endorses expunging some drug-related criminal records, while providing funding for minority business development.